Want to get out of town and experience a real Alaskan homestead? We offer customized vacations at our home on a bluff overlooking the Tanana River, about an hour's drive from Fairbanks. 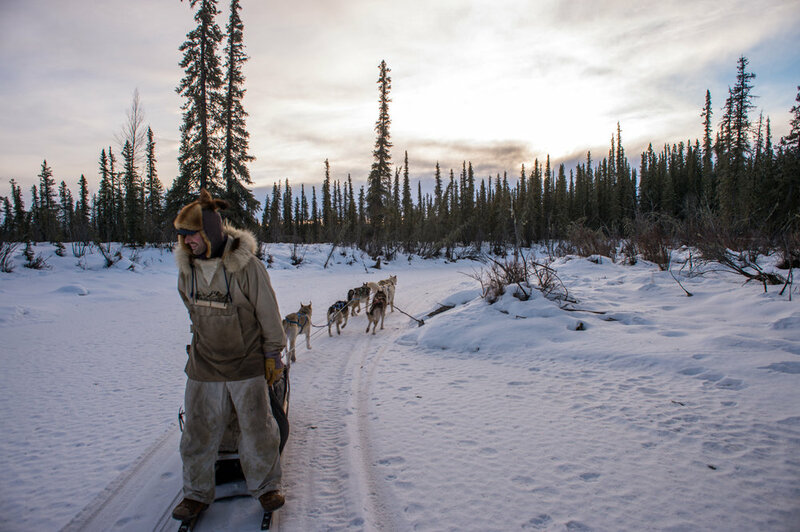 These trips give you an authentic Alaskan experience that you will can't find in town. We take only two people at a time, and when you're here we cater to exactly what you want to do to make your Alaska dreams come true. Spend your days mushing a dog team down the river, snowshoeing on a sunny bluff, ice fishing for Burbot, carving a wooden spoon, and enjoying the sunset by an open fire. Take a break from hotel rooms and savor the warmth of a woodstove and the rustic luxury of your very own hand made log cabin. Enjoy home cooked local Alaskan food and if you're lucky you'll see the after dinner show: the Aurora Borealis dancing in a clear night sky. Cost: 2 people: $750/day, 1 person: $700/day. Minimum trip length of one night counts as 2 full days, and lasts from about 10am on first day to 6pm on second day. Food, lodging, guiding, winter gear, dog mushing and other activities included. The Sun lodge cabin where our guests stay is a great place to observe a starry night sky. BOOK NOW: The first step is to fill out the form below or e-mail us at borealjourneysak@gmail.com. Once you have confirmed the dates of your trip with us, you can use the Paypal button below to complete your reservation by paying $500 down payment. This is fully refundable if you cancel at least two months before your trip's start date.You can pay the remainder with cash or check when we see you. Date(s) you would like to visit, please be as broad as possible. Thanks for contacting us! Your information has been sent to us and we look forward to corresponding more with you soon! If you have any urgent questions, please call Jenna at (248) 568 0345. 10- We'll pick you up from your hotel in Fairbanks and hit the road. The drive is about one hour and takes us past impressive views of the Tanana River Valley. You can choose to snowshoe or mush into our homestead, we have beautiful trails for either option. If you choose to mush, we will teach you the basics at this point. 1- Arrive at the homestead. Get settled in your cabin and we'll give you a tour and some hot lunch. 2-4- If you want to try ice fishing we will load up a sled and walk along the frozen river to the fishing eddy to chop a hole in the ice and set some burbot sets. 4-5- Snowshoe tutorial- get comfortable on snowshoes and you can go anywhere! We’ll fit snowshoes to your feet, tell you about different types and techniques and let you practice. We can go on a snowshoe hike and explore scenic overlooks and winding trails. 5-6:30- Relaxation time. Drink a glass of wine or cocoa. Play games in the cabin, dry your clothing, get settled in. 6:30—Candlelight dinner in our dining tent. We're happy to accommodate special diets as long as you tell us in advance. We’re also happy to feed you local fare. 10pm-2am- This is the best time to check for the Northern Lights. If the skies are clear and the forecast is good we can make a bonfire to sit and enjoy them by. We have multiple viewing points for this ephemeral show. 10-3- Explore the valley with a day trip by snowshoe or dogsled and have lunch on the trail. We’ll catch up on what has been going on in the country by examining animal tracks, river ice conditions, etc. Places we can visit include caves, tributaries, beaver lodges and more. If you feel like relaxing at home, we can get you started on a crafting project like making a wooden spoon or birch bark box. 3-4- Camp chores- splitting wood, chopping a hole in the ice to get water, cooking fish for dogs (optional). 4-6:30- Relax and enjoy the long sunset from your cozy cabin. More northern lights! Or maybe just a really good night of rest in the deep quiet of a wilderness cabin. 2-3- Pack up your gear and load the sleds. 3-5- Hike or mush back to car. Drive back to Fairbanks in time for dinner and a shower! Where you sleep is part of the experience! Stay in our sod-roof cabin, the Sun Lodge and dine in the Kitchen Tent. The Sun Lodge boasts a beautiful view of the Alaska Range on clear days and the Kitchen Tent faces North America's tallest peak. Both cabins are heated by homemade woodstoves. To learn how we built them, see our blog. Water- We get water from the Tanana River by chopping a water hole through the ice and then carrying the water up the hill. For our guests, we filter/purify all of the water. We will have buckets of cold drinking water available and there will always be a kettle and a big pot of hot water on the woodstove for hot drinks and washing. Heat- Our cabins are heated by wood. We’ll teach you how to make good fires and are happy to make a morning fire for you! We love heating with wood and think you’ll enjoy it too. Power- We have a battery system that we use to power LED lights. We also have an inverter that you may use to charge cell phones, cameras, etc. but the system is fairly small. Cell service- depending on your carrier, you may or may not get cell reception. We have phones that work in case of emergencies and generally discourage clients from using phones too much as they can detract from the experience. Bathing- We encourage sponge baths- we’ve got bowls, wash cloths, towels, essential oil and soap for you, it’s a nice thing to do by a roaring woodstove! Bathroom- You have a private outhouse with a great view. Food- We will do all the cooking and serve meals in our communal kitchen cabin. Your trip is custom-designed for you. We think a good trip is the result of a nice mix of adventure, relaxation, and learning. Here are some ideas of how you can enjoy each category. Explore- On foot, snowshoe, ski or dogsled, there is adventure to be had! Take day trips from camp with our dogs, skis, snowshoes or on foot. Ski, snowshoe, or walk our trails, or make your own! 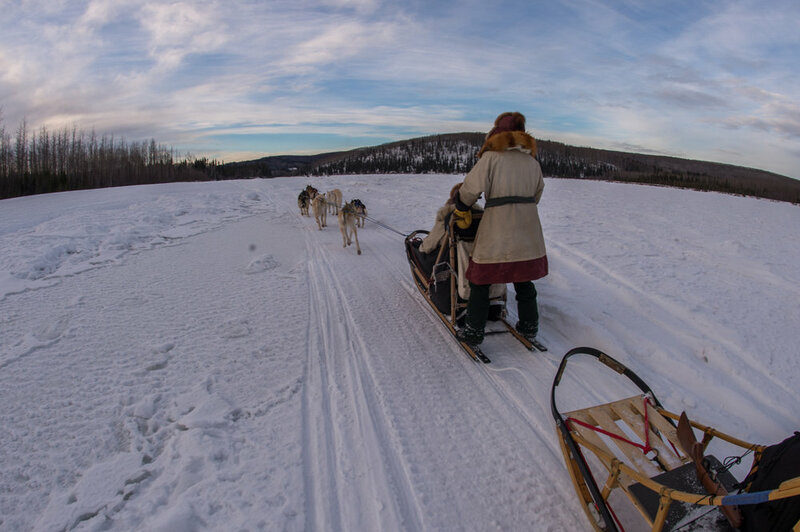 Go mushing with the dog team for day trips and build up your strength, skills, and confidence. Explore beaver lodges, caves, learn about safe travel on river ice. Drill a hole in the ice and set lines to fish for burbot. Relax- Peace, quiet and maybe some aurora borealis. Enjoy some peace and quiet! Relax in our simple, hand-made rustic lodges and tents. Play games- we've got cards, yahtzee and a few tricks up our sleeves! Subsistence Skills- Learn something new! Both David and Jenna love the Alaskan lifestyle and are happy to teach you about it. Go on an animal tracking walk and learn to read the stories in the snow. Wild edible walk- learn about wild food and how to process it, taste some too! Tool time- learn axe and saw handling techniques and improve your swing. Wilderness survival skills like making bow drill fires. Trapping tips- learn how we catch furbearers for clothing and food. Shelter building- try your hand at making a quinzee (snow cave) and learn how David used to live in one! 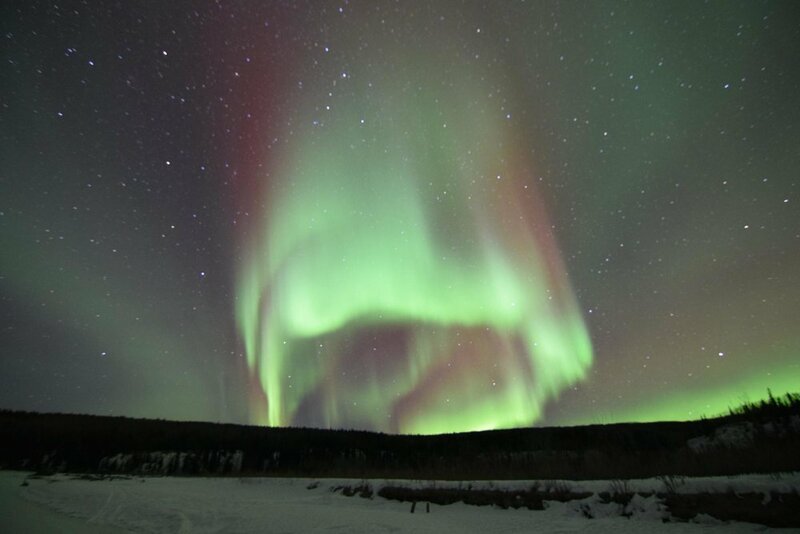 My 11 year old son and I wanted to visit Alaska for his Spring Break while searching for a simple Northern Lights excursion stumbled across the Boreal Journeys Alaska website. ....This place was amazing - totally off the grid with no electricity (a small solar panel however that charges phones and cameras), no running water (great filtered river snowmelt), and no indoor plumbing (but an outhouse with the most amazing view). For 3 days we mushed, ice fished, snowshoed, and even built a snowcave. And - we were able to see the Northern Lights on the most incredibly clear night I’ve ever experienced. David and Jenna are wonderful hosts - we had great food, conversation, and learned a ton about living off the grid in Alaska. I don’t think there is anything this couple can’t do to survive off the land.